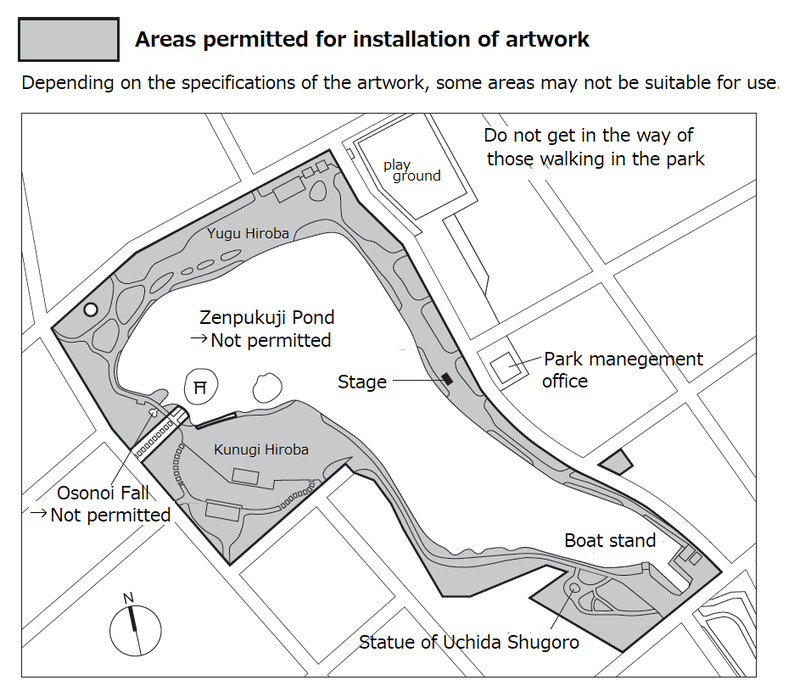 Open Call for Submissions of Artwork Proposals for Zenpukuji Park ! 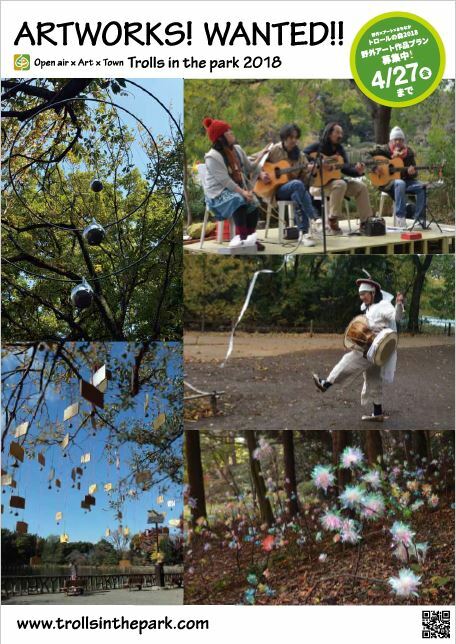 Trolls in the Park is a contemporary art exhibition held annually in November in Metropolitan Zenpukuji Park and the periphery of Nishiogikubo Station, first initiated in 2002. 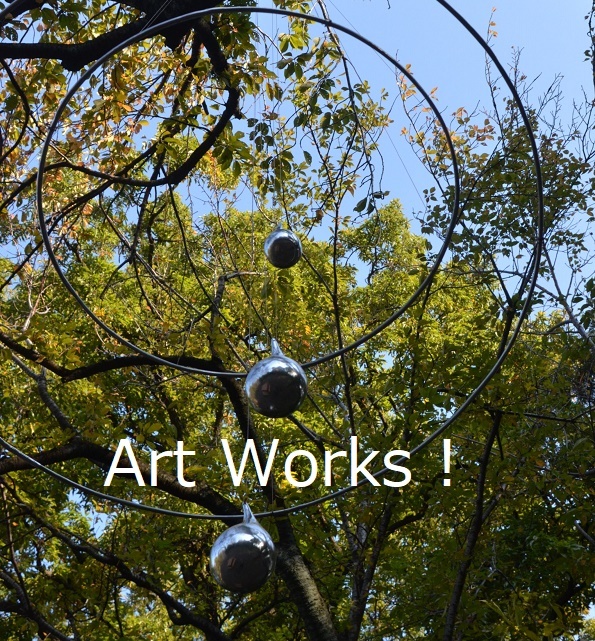 This year, there will be an open call for the submission of artwork proposals for Zenpukuji Park, welcoming a broad spectrum of proposals from　installations (spatial representation) to performance-based work (physical expression). We look forward to receiving proposals that convey the appeal of this area, incorporating the characteristic culture, history, and nature of Zenpukuji Park, its facilities and the surrounding landscape. Venues (areas open to proposals): Metropolitan Zenpukuji Park (vicinity of the upper pond) [Tokyo, Suginami Ward, Zenpukuji 3-chome] *Metropolitan Zenpukuji Park is a public park open to the public 24 hours a day (free admission). *However, participating artists are required to pay an administration fee of 20,000yen following selection. Exhibitors will be selected by the Organizing Committee through a primary screening based on applications, and through a secondary screening involving a review of applications in addition to interviews with candidates. Applications must arrive no later than April 27 (Fri), 2018, sent either by email or post. (vertical layout on A4 paper / single-sided / freely designed / within 3 sheets). * Documents exceeding the specified number of 6 sheets will be excluded from the review of applications. *Please refrain from using staples or plastic files when submitting applications. *Submitted documents will not be returned to applicants. Please send as PDF documents, making sure that filenames include the extension “pdf”. ・When sending via email, please write “Trolls 2018 Application” in the subject box. ・The overall file size should be within 3MB. ・No restrictions are made based on age, nationality, or whether applications apply to individuals or groups. ・Works must be finished within the stipulated installation period that runs until the day before commencement of the exhibition. ・Works must be of sufficient durability to be able to withstand all weather conditions for the approx. one-month period of the exhibition (including the period of installation). ・Maintenance (and inspection) of artworks for the duration of the exhibition is the responsibility of the artist. ・It must be possible to return the location used in the park to its original state at the end of the exhibition. ・Performances are limited to the time slot of 10am to 4pm. ・Mains power sockets and acoustic equipment is not available to rent from the committee, and so exhibitors are required to provide their own. Generators or mains power drawn from outside the park is not permitted, so only use of battery-operated equipment is possible. ・The number of performances will be decided after consideration of the locations and times requested by all performers. ・ Decisions about whether to postpone or go ahead with performances in the case of bad weather will be made through consultation between the committee and performers. ・The committee take no responsibility for damage to or soiling of equipment and/or costumes in the case of bad weather or in any other event. ・The use of or entry into areas outside those permitted for the exhibition. ・The use of light or sound that is harmful to the park and its surroundings. ・The use of fire, smoke, or large amounts of water. ・The collection of admission or performance fees. ・Infringement of copyright or publicity rights of third parties, or representation contrary to public order or morality. ・In principle, all exhibitors are expected to participate in the second screening (selection by interview held May 20 (Sun)), the general meeting (June 10), a public explanation of proposals (September 9) and the art tours held during the exhibition (first and last day). Copyright of artworks remains the sole property of the exhibitors. However the organizers reserve the right to use artworks for the printed advertising, the website and posting on other web-based media, use in catalogs, the production of goods relating to the exhibition, and for the general administration and public relations of the exhibition. The organizers also reserve the right to make modifications or changes to the images of artworks for such purposes. Costs relating to production, de-installation, postage, travel, transportation, and accommodation incurred during the application process and the exhibition are the responsibility of exhibitors. As a general rule, exhibitors are expected to realize works based on the plan submitted during application. In some cases, the organizers may request changes to the content of works in cases when, after consultation, it is deemed necessary from the point of view of safety or maintenance, etc. The organizers will safely manage the personal information of applicants, and shall not provide it to third parties. However, the use of personal information provided by applicants may be used at the time of implementing the current exhibition or for documentation sent to the applicants of the following year. The name, CV, and image etc. of exhibitors will also be published. ・Only applicants deemed to have accepted the content of these requirements at the time of application will be considered. ・No exceptions can be made in regard to the final selection. ・Refusals to participate on the part of exhibitors are not permitted once exhibitors are confirmed (after the results of the second screening have been issued). ・Participation in the exhibition may be cancelled if applicants violate these regulations. ・The organizers will make a decision after consultation should there be any issues relating to the selection process or the signing of contracts after confirmation of exhibitors not described in these guidelines. Enquiries are only accepted by e-mail. In some cases, there may be a delay in the organizers’ response. *No response can be given to questions regarding the results of the selection. *Based on the proposals made in the applications, artworks will be realized through meetings between the organizers and exhibitors to discuss the safety, durability, laws relating to natural parks and the fulfillment of any other legal requirements. *An art tour for the general public (the first and last day) is planned during the exhibition. The participation of all exhibitors is requested.